There were a couple of items in the poker news this week involving Phil Ivey. 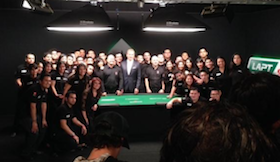 The Ivey Poker training site remains up and running. I’m not sure about the fate of its roster of pros, not mentioned in the presser. I thought I saw one of them tweet some kind of parting message wishing the company the best (or something), but I can’t track that down at the moment. I’m not on Facebook, and so I never tried the app over there. I believe there was a version launched for the smart phone a little over a year ago, but I didn’t look into it. The site has been around for some time, seemingly poised initially to jump into some sort of regulated U.S. online cash play when it came to be although that hasn’t come to pass. On the heels of that news was another item that Ivey was one of 26 applicants obtaining approval from Las Vegas City Council this week for a city permit to grow and sell medical marijuana. While the news about Ivey Poker’s app being shut down was hardly unexpected, I don’t think anyone saw this story coming. The article in the Las Vegas Review-Journal is kind of funny to read insofar as it details all of the specifics of the hearings and approvals then at the very end of the article includes a short list of some of the applicants, with “professional poker player Phil Ivey” being the last one mentioned. As the whole Ivey Poker experiment suggests (as does his significant involvement with Full Tilt Poker 1.0 before that), Ivey has long had an entrepreneurial urge, so I suppose the latter news isn’t completely without some context. Still kind of odd to encounter Ivey’s name in the list. Those getting the approvals from the city could still be prevented from starting their medical marijuana businesses should the state health department decide against allowing them to do so. I guess Ivey and the others figured it’s a chance worth trying, with the reward outweighing what appears a not-so-huge risk. We’re less than a week away from midterm elections here in the U.S. Of course, anyone in this country who has turned on a television set, been near a computer, or receives mail knows that already thanks to the relentless campaign ads greeting us at every turn. Was reading today over at Slate how this year the total number of ads concerning the 36 races for U.S. Senate seats is approaching 1 million. Here in North Carolina the race between incumbent Kay Hagan (D) and her opponent Thom Tillis (R) has produced more ads than any other in the country, currently coming at a clip of about 11,000 ads per week or about one ad per minute, they say. The Slate article further notes how the great majority of campaign ads this year have been negative, something about which I found myself commenting out loud to Vera just a few days ago. 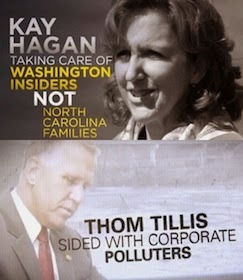 I’d noticed that practically none of the ads for Tillis featured him at all, only Hagan, while the Hagan ads all seemed only to be showing Tillis. The article notes how the week before last “all but two-dozen” of the nearly 11,000 Hagan/Tillis ads “contained at least some negative content.” That ratio changed a bit this week with more than 500 non-negative ads -- “roughly 5 percent” of the nearly 11,000. It’s clear that in the current political climate “going negative” is the preferred approach. The rise of social media -- even more prominent and integral to Americans’ lives today than even two years ago -- might well be a primary factor here, as is current news media and the constant (and influential) efforts of many to voice and inspire outrage wherever possible, legitimate or otherwise. The approach is hardly new, though perhaps more popular today than ever, and affirms how in politics any effort that is antagonistic to your opponent is considered equivalent to (or perhaps even better than) promoting yourself. I was trying to imagine an analogy from poker -- a “zero sum” game in which one can only benefit to the detriment of others -- and I think I came up with one. Say each candidate has a certain amount of chips with which to play, with each chip representing one campaign ad. In poker when you make a bet, it is often either because you like the strength of your hand or you doubt the strength of your opponent’s hand. There are times, of course, when you aren’t sure and so your bet may not be so easily categorized, but let’s just focus on those two reasons for betting here. The former bet would be a “positive ad” bet, made as a way of “supporting” your good hand. The latter bet would be a “negative ad” bet, made as a way of “attacking” what you perceive to be your opponent’s weak hand. 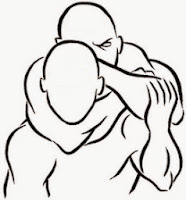 In the latter case, your cards aren’t really that important -- you could hold anything, with your action primarily motivated by your perception of an opponent’s weakness. Which I guess would mean in these races overwhelmed by both sides almost exclusively going with negative ads, the actual strength of each candidate is mostly irrelevant. In any case, I’ll be glad when next week comes and all the chippiness finally ends. I was mentioning yesterday how that other World Series -- of baseball, not poker -- had emerged for me as one of several distractions from ESPN’s coverage of this year’s WSOP Main Event. Tonight the Kansas City Royals and San Francisco Giants play a winner-take-all Game 7, something that comes along rarely enough that even a long-lapsed baseball fan like me will be forced to take a look. I’ve written here before about how devoted I was to baseball as a youngster. It was easily my favorite sport both to play and watch up through my middle teens, at least, although by the time I was a senior in high school my devotion to the game had begun to waver. In fact, it was that fall I can pinpoint a particular day when baseball suddenly became less important to me. 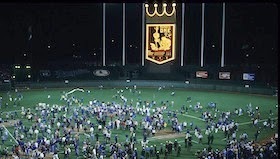 During the Royals’ playoff run this year many have been pointing back to the last time Kansas City made the playoffs way back in 1985, when, coincidentally, they won the championship in a World Series that also went seven games. Those references reminded me of that Game 7, not because of what happened during the game, but because I didn’t see it at all. The game was on a Sunday (I remember). It was my senior year, a time when I’d already started looking at colleges. I can’t remember if I’d sent any applications by late October or not, but I probably had. I made decent grades in high school, good enough to put me in the running for some scholarships, including one for the school I wanted to attend, UNC-Chapel Hill. The specifics escape me, but for this particular scholarship there was some sort of get-together I could not avoid that was scheduled for that Sunday evening. I’d submitted some written materials, including an essay showing whether or not I knew how to put sentences and paragraphs together. Then on this day there was a personal interview with a committee, followed by a dinner for all of the applicants. It was a novel experience for me. The only thing I remember about the interview was that the person leading the five-person committee was blind. He smiled a lot, though, and had a friendly tone that helped keep everything from becoming too intimidating. And the only thing I remember about the dinner afterwards was commiserating with some of the guys from other schools about how we were missing Game 7. I suppose I could have gotten out of it, but at the time it seemed like one of those things I just had to do. Looking back, it’s tempting to read my decision as one of those fork-in-the-road moments where I chose not to watch a baseball game as my younger self would have done, but instead did the “mature” forward-looking thing with an eye toward my future. That surely exaggerates the moment, though, charging it with more meaning than it really had. I also remember how missing the game turned out to be much less of a big deal than it seemed at the time. Maybe it was because the game was -- much like last night’s Royals win -- a laugher, with Kansas City winning 11-0. Or maybe it was because lots of other interests had already begun to crowd into a boy’s still-forming mind, pushing baseball over into what would become a mostly-neglected corner. I didn’t get the scholarship, although I did end up going to UNC-Chapel Hill, and that led to all sorts of other good things for me (not the least of which being meeting Vera during our first week on campus). The next fall I was a college freshman, way too distracted to pay much attention to another great World Series between the New York Mets and Boston Red Sox that would go seven games as well. I’d look in on the World Series occasionally thereafter, and I became somewhat invested in the Atlanta Braves (my team as a kid) as they finally started winning and playing some exciting playoff games in the 1990s -- among them a heartbreaker of a Game 7 in 1991 which I did watch. But I’d never again be as big a baseball fan as I had been prior to October 27, 1985, the day I didn’t watch Game 7. Have to admit I’ve more or less drifted away from following the 2014 World Series of Poker coverage on ESPN this month. Going up against Sunday Night Football has lost them one viewer in this household, and while I DVR’d the sucker the first couple of weeks I haven’t been moved even to do that lately. Not picking up things until Day 4 made for some added awkwardness narrative-wise when it came to telling the story of what happened this summer. 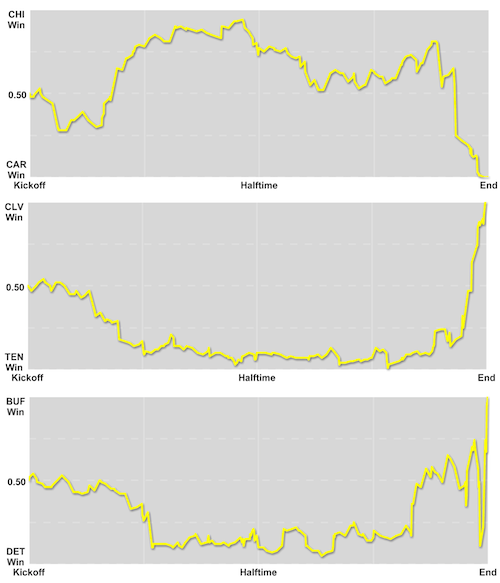 There were some okay moments and an interesting hand or two involving Phil Ivey during those first two hours, but as I’ve said here before about these edited shows, knowing outcomes (e.g., Ivey’s pre-deep run bustout) considerably lessens what is already small amount of suspense in evidence. The inordinate focus on amateur player Curtis Rystadt and his relentless antics on Day 5 were a big turnoff for me as well (literally). Exhibiting all sorts of poor etiquette and cringe-worthy behavior -- none of it terribly representative of how the great majority of players act at the WSOP -- Rystadt was made the center of attention during that week’s shows. So I’m not really watching, and in fact this year I may well miss out on the final table, too, as it looks like I’m scheduled for a tourney trip during those days. Speaking of the November Nine, Chris Tessaro has a new column for All In punningly titled “Waited Down” in which he’s revisiting the delayed final table idea -- now in its seventh year, if you can believe it -- and wondering if the WSOP and ESPN might consider altering its approach going forward. There’s much I still like about the shows -- including Norman Chad, Lon McEachern, and Kara Scott -- but like Chris I’m finding the current approach to the coverage to be far removed from the immediacy and excitement of what tournament poker actually can be. And with NBA starting up and that other World Series going the distance, it’s making it even harder for this sports fan to tune in to watch the card playing. On February 5, 1961, Oskar Morgenstern wrote an article for The New York Times titled “The Cold War Is Cold Poker” that argued for poker -- and against chess -- as the game best suited to parallel the ongoing diplomatic conflict between the U.S. and U.S.S.R.
Morgenstern argues that since “chess is the Russian national pastime and poker is ours, we ought to be more skillful than they in applying its precepts to the cold-war struggle.” Alas (in his view) that had not been the case by early 1961. Thus does he proceed to argue in favor of the country’s leaders becoming more studious about poker strategy, particularly highlighting the need to learn how bluff effectively (and responsibly) and to learn how to recognize the Soviets’ bluffs, too. “The problem of how, on the one hand, to make a threat effective and, on the other, to recognize a genuine threat by your opponent is one of the most fundamental of the day,” writes Morgenstern. As the co-author with John von Neumann of the groundbreaking and influential Theory of Games and Economic Behavior (1944), the German-born economist had by then thought at great length about how certain games usefully mimic strategies employed by individuals and groups -- including governments -- in various economic, political, and military contexts. An early essay by von Neumann “On the Theory of Parlor Games” (1928) explored how poker’s bluffing element helped make the game suitable to study as a means to learn more about deceptive behaviors in other contexts. That essay was expanded upon considerably into a chapter called “Poker and Bluffing” in Theory of Games and Economic Behavior, with the pair’s work often being cited as having pioneered what would come to be called game theory. Morgenstern would go on to work as an advisor for Eisenhower, while Von Neumann would likewise be involved in Cold War strategy while chairing a secret Intercontinental Ballistic Missile Committee before his death in 1957. Thus by 1961 Morgenstern had well developed his “Cold War is Cold Poker” idea, and he lays it out in full in the NYT piece. It was an influential argument. Kennedy would get variously credited with having reaffirmed the “we play poker, they play chess” idea, further underscoring both cultural differences and the contrasting strategic approaches of the two super powers toward each other. And further promoting the “poker provides a better approach” argument as well. Those retrospectively viewing the conflict today (with knowledge of its ultimate outcome) -- and indeed, contemporaries commenting on it then like Morgenstern -- therefore mostly champion the America’s “poker” approach as preferable to Soviets’ “chess” tactics. 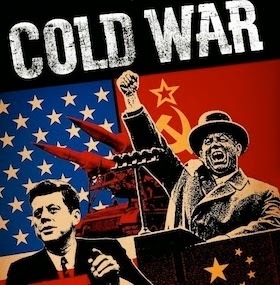 “Whereas the Communists are waging a game of chess, with moves as scientifically planned as possible,” noted Wiznitzer, “the Americans are improvising poker moves and bluffs, without a master plan or aim, and depending more or less on their last hand, or reacting to the enemy’s bet.” Since “politics is not a game nor simply an art” but rather a “science,” he insists, the long-range thinking of chess is actually preferable to the overly reactive game of poker. “You cannot beat chess with poker,” he concludes. It’s an interesting response, and the failure of the Bay of Pigs invasion less than two months later -- soon recognized as a woefully shortsighted “play” with especially damaging consequences for the U.S. -- probably helped convince many that Witnitzer, not Morgenstern, was on the right side of this debate at the time. Was curious this afternoon to see what might happen up in New Jersey regarding its efforts to legalize sports betting. You might have heard the legislature in the Garden State rushed a bill through both houses last week and a day later Governor Chris Christie signed it, and all was in place at Monmouth Park to start taking bets on the NFL games this Sunday. 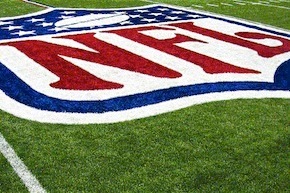 Earlier this week came the complaints from the NCAA and the four major professional leagues (NFL, NBA, MLB, and NHL) who took the position that the New Jersey law which would allow casinos and horse tracks to take sports bet was “in clear and flagrant violation of federal law” (the Professional and Amateur Sports Protection Act of 1992). The leagues sought an injunction to keep New Jersey from going forward with sports betting, New Jersey filed a response to the complaint, then all waited to see what U.S. District Court Judge Michael A. Shipp might do. Without any sort of ruling, bets could be taken, but Shipp could step in to issue a temporary restraining order so more time could be taken to decide on the case. In the interview, Brennan spells out how it was a little extraordinary for such a restraining order to be granted, but Shipp had a history of ruling in that direction on this issue and so his decision wasn’t a surprise. So they’re on hold a little longer in New Jersey on the sports betting front. Meanwhile they’re still playing online poker and gambling in other ways there, and of course fantasy sports continues to be enjoyed all over the nation. 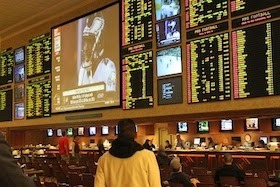 Allowing sports betting in the ailing Atlantic City casinos (those that remain, anyhow) and at the horse tracks doesn’t seem terribly out of place from afar, and the leagues’ complaints against it seem disingenuous when sports betting already happens legally in Nevada (and illegally everywhere) and the leagues have continued to survive. Will remain curious to see if it ever comes about. 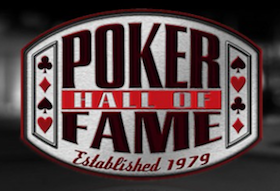 I mentioned a few weeks ago when the nominees for this year’s Poker Hall of Fame were announced how this year I was not part of the panel of media who voted along with the living PHOF members. I had that privilege to cast a ballot for the previous four years, actually. Was honored to have had the chance to take part and happy to step aside to allow others the chance to do so. Today the WSOP announced Daniel Negreanu and Jack McClelland had been voted in, with Negreanu a “first-ballot” Hall of Famer as he just turned 40, the minimum age for induction. As I didn’t participate this time, I’m not 100% sure on what the instructions were for those who did. In the past, we’d receive the ballot with the 10 nominees listed and vote according to a “10-point must system” meaning we had 10 points we had to assign to one, two, or three candidates. So we could give all 10 points to one nominee, split the points among two or three, or even vote for no one (I think). Then the points were all tallied and the two candidates who received the most total points were elected. I believe at some point early on there was talk about a candidate needing enough points to exceed a minimum overall percentage to make it (as in the Baseball Hall of Fame), but if I’m not mistaken they just take the top two point-getters, however many points they happened to get. Like I say, I don’t know if they used the same system this year, but if they did I have to imagine everyone had to have given Negreanu some of their points, perhaps even most of them. And I’d guess many of the living PHOFers likely cast votes for McClelland, as well as some of the media. Negreanu’s poker résumé is so extensive it goes without saying he was a shoo-in and much deserving. McClelland recently retired at the end of last year after four decades in poker, a time that included serving as a tournament director since the 1980s in various poker rooms (including at the WSOP). I was at McClelland’s last tourney, actually, the WPT Five Diamond at the Bellagio last December, where there were some nice moments of recognition for him at the final table. His contributions to poker are harder for those who came into the game more recently to appreciate, but he’s clearly had a significant influence that many have regarded as especially positive. There will be a ceremony at the November Nine to recognize Negreanu and McClelland. Perhaps next summer the WSOP will consider my Poker Hall of Fame idea to construct some sort of temporary “Hall” in the halls of the Rio. 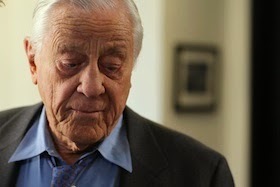 Ben Bradlee, the longtime executive editor of The Washington Post who became a nationally-known figure for his role managing the paper’s reporting on Watergate, has passed away at age 93. Like most, my knowledge of Bradlee and his career has been mostly confined to that period during the early 1970s when he guided Bob Woodward and Carl Bernstein’s reporting on the Watergate break-in and subsequent cover-up, although as the many remembrances being published this week show his influence and significance in journalism extends well beyond that important period in American history and politics. If you’ve seen the 1976 film All the President’s Men, you’ll recall Jason Robards played Bradlee -- excellently, as Robards was in everything. In fact he won an Oscar for Best Supporting Actor for what was really a small part, though perfectly pitched with the gravitas appropriate to someone in Bradlee’s position of authority. I liked the character of Bradlee -- both in the film and in real life (in the context of reading Watergate, where I’ve mostly encountered him). Via Robards he comes off as partly a parental figure, partly a tough-minded coach, possessed of both the relevant experience and unassailable intellect to make sound decisions. I think I like the character so much mainly because of my own experience both as a teacher and as an editor, roles that require not just being able to pull out the red pen and use it unhesitatingly, but to be willing and able to assume responsibility for others when required. Not accepting what you are told (or what you see) at face value is obviously a skill great poker players cultivate, their training to do so advanced by the consistency with which opponents “don’t tell the truth a hundred different ways.” Inspiring such skepticism and inquisitiveness -- something I like to think I’ve been able to do here and there as a teacher and perhaps outside of the classroom occasionally, too -- is a good legacy to leave. Today’s news moves the needle even less. Hansen has long remained a figure of interest to many thanks to his win in the very first televised World Poker Tour event way back in 2002, his high-level involvement with FTP as a member of Team Full Tilt, and his continued participation in the “nosebleed” stakes games on the site where he’s reportedly lost over $20 million, including more than $17 million on the site during the last two years (according to High Stakes DB). Blom, too, has fascinated many ever since the mysterious “Isildur1” showed up to challenge all of those Team Full Tilters and the rest of the world in late 2009. I’ve written here many times about Blom, including how intriguing it was to report on him at the WSOP. High Stakes DB shows Blom sitting around break-even during his almost two years playing on FTP 2.0, having been up nearly $6 million during the first six or seven months before falling back down to where he was on the site back in November 2012 (down a few milly). The last post I wrote here about Hansen was in January 2013 when just a couple of months after FTP 2.0 went live he fired off some tone-deaf tweets in defense of Howard Lederer that were dismissive of just about the entire online poker community. The title of that post, “Ungrateful Gus; or, Hansen on High,” suggests how his thoughts were received here. The last one I wrote about Blom was right about the same time, the title of which was a response to enthusiastic tweets from the FTP account reporting his presence at the high-stakes tables on the site: “Blasé About Blom.” Again, the title is an indicator of the attitude expressed in the post. Today the dissolution of “The Professionals” altogether brings a different thought to mind about the significance of sponsored pros to online sites. I actually think they can serve a great purpose, even today, not just in helping attract players and building sites’ presence, but in helping to advocate for poker, generally speaking. The Team PokerStars Pros are an obviously well managed example of this, with players all over the world doing a lot to help explain and promote poker to wider audiences in their respective countries. I’m realizing today, though, that FTP’s “Professionals” idea -- a dim echo of Team Full Tilt from the start -- had very little to do with establishing and strengthening connections among members of an online poker community. Rather, its whole ethos was to emphasize the impassable distance between Hansen, Blom, and Dwan and the unwashed masses. The spectacle of watching “The Professionals” play for high stakes was mildly diverting for some, but hardly inspiring for most, particularly given the seeming apathy -- or even antipathy (in Hansen’s case) -- they appeared to have for the poker community as a whole. 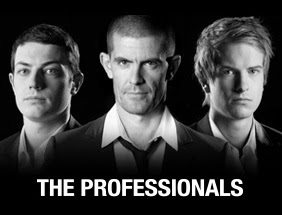 In fact, the news of the end of the “The Professionals” makes me think of what a table full of amateurs might say to each other after a pro player finally gets up to leave after having made things difficult for them for the previous several hours. The final day of play in the LAPT Peru Grand Final Main Event took a while, starting at noon on Sunday and lasting until just about 9 p.m. before Oscar Alache of Chile came away with the victory following a three-handed deal. Was kind of a neat way to end Season 7 for the tour, with eight players from eight different countries (seven of them in Central or South America) vying for the last title of the year. Heads-up between Alache and the 65-year-old Uruguyan Daniel Campodonico was kind of curious, actually, with both players almost always just limping in from the button, the other almost always checking, followed by a lot of passive play postflop. The only variation would come with open-raises all in, although the key hand of the match saw a limped pot produce a check-bet-shove-call sequence. Alache had flopped two pair with 7-3-offsuit, Campodonico a flush draw, and the two pair held to give Alache a big lead before he finished things off. There had been room for some postflop play, if the players had wanted to engage in such -- there were about 70 big blinds in play for a lot of their duel -- but neither chose to do much other than call or check or shove. All in all it was a nice finish for the season with such a big turnout and a record prize pool (for Lima) for the LAPT. There’s a lot of anticipation surrounding the Season 8 kickoff in the Bahamas -- coming just before the PokerStars Caribbean Adventure -- as well as a lot else LAPT-related to come. Fun spending the week with so many people excited about poker, and of course to get the chance to work with such a great group of people as are part of the LAPT. Long day of travel ahead. Talk to you again from the farm. An unexpectedly fast one yesterday at the Latin American Poker Tour Peru Grand Final. Not sure why I always come to these events anticipating days to last longer than they ultimately do, but one of these times I’ll remember that on the LAPT the pace is pretty much always muy rápido. We had 45 players to start the day and had to play down to eight. Settled in thinking it would take us deep into the night to get there, but they managed to work all of the way down to that goal in just under six one-hour levels. Was a wacky day, really, with the player who started it in 41st place out of 45 -- Jerson Backmann of Mexico -- ending the day with a big chip lead. Another one, Argentina's Jose Torre, was in 44th position, and he made the final table, too, with a middle-of-the-pack stack. Meanwhile Nacho Barbero's quest for a third LAPT title came up short as he busted in 17th. The early finish allowed us finally to break free from the casino and head a few blocks away to enjoy a nice meal at a restaurant called Punto Azul where I enjoyed a delicious dish of fettuccine full of seafood with the black squid ink adding some extra flavor and character. Having to be muy rápido with posting today as the final table is drawing near. Check the PokerStars blog today for updates, and while you’re watching the NFL perhaps look in on the LAPT Live stream as well. It was a long one yesterday -- another noon-until-after-midnight shift -- and it’ll be another long one today, as well. 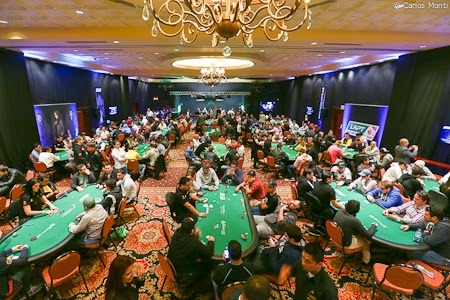 The field of 692 entries in the LAPT Peru Grand Final has now played down to 45 players, which leaves a lot left to take care of before the final table can be determined for Sunday. Kind of incredibly, Nacho Barbero is leading heading into play today. Barbero has won two previous LAPT Main Event titles, one of only two players to achieve the feat along with Fabian Ortiz. He won them both during Season 3 -- back-to-back in fact -- and as it happens his second victory came here in Peru in 2010, my first trip to help cover an LAPT. Nacho ended the night with a ton of chips, but came perilously close to busting in 104th on the stone cold bubble when he was all in with A-K versus an opponent who’d five-bet shoved on him with 10-8-suited. The flop brought a flush draw to his opponent, and after the turn both the ten and eight were still live, too. But Barbero faded the river, and after the bubble burst picked up some big pots to cruise out in front of the pack. Nacho recently ended his tenure as a Team PokerStars Pro -- a mutual decision between Stars and the Argentinian -- which perhaps might add a little extra intrigue to his doing well in this first tournament after that event. He’s got a lot of other interests, I know, including running what I’ve heard is an excellent restaurant in Argentina, but poker is likely going to remain a central focus for him for now. 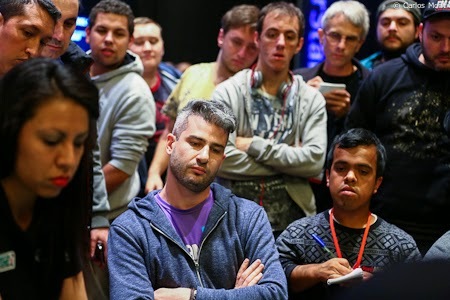 Besides reporting on Nacho at night’s end (evidence of which can be found in the picture above), I had fun writing up a post about Leandro Csome, a.k.a., “Peluca,” after he happened to be the one knocking out the 104th-place finisher and thus bursting the money bubble. That event reminded me also of the LAPT event here in Lima from back in Season 3, and a funny story involving Csome that happened as the bubble neared in that event. The dealers are here and the bags full of chips are starting to be distributed to the six tables. Soon the players will come and cards will be in the air again. As always, head over to the PokerStars blog to follow the action, and when you’re done with the EPT Live show from London perhaps dial up LAPT Live -- it’s only in Spanish or Portuguese, but as everyone knows poker has its own language anyone acquainted with the game can follow. 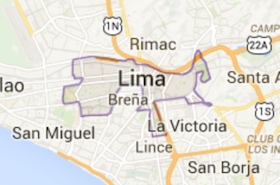 All goes well in Lima. The turnout turned out better than anticipated, with 692 total entries -- way over the 557 from a year ago. The prize pool is also up over $1 million, a first for the LAPT here in Peru. I continue to eat very well, even if I’ve been confined to the Atlantic City Casino each day thus far. Such will likely remain the case at least until Saturday when we’re hoping possibly to have a shorter day and thus a chance to enjoy a nice dinner elsewhere. Still, I can’t complain. I can also confidently state I’ve eaten more octopus this week than I have all year. I also ordered a dessert the name of which provided the title above, discussed further here. Had a chance yesterday to chat with Thomas Lamatsch who is serving as the Tournament Director here this week. Thomas is usually to be found on the EPT, but is filling in for LAPT TD Mike Ward who had to miss this one. It’s a first trip to Peru for Thomas, and we had a fun conversation comparing the tours and talking about the future of poker. Another highlight yesterday was talking to the newest Team PokerStars Pro Online member, Celeste “LadyMace86” Orona of Argentina. The announcement of her joining the team was made during the day yesterday, and she took some time during the dinner break to chat about her background. Her story kind of reminded me a little of my own, at least with regard to her leaving a comfortable, “normal” career path (in her case working in the corporate world) and trying something new with poker. Come to think of it, so did Thomas’s tale, particularly when he speaking of how friendly and supportive everyone is here on the tour. 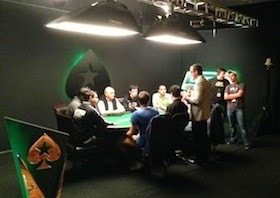 Going to run again, but check in over at the PokerStars blog for more poker talk from Peru. 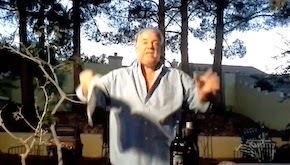 We were nearing the end of the night yesterday when I told Sergio, my blogging colleague here on the LAPT, how it always seems to happen that Day 1a takes the most out of me. I think it has to be mostly related to the travel which usually immediately proceeds those first Day 1s, with the fact that those days are almost always noon-to-midnight (at least) and thus usually the longest ones to cover. The field of 274 entries was decent-sized, and with a bigger Day 1b (as anticipated) the overall turnout will exceed that of last year’s LAPT Peru. Had some fun during the day playing a poker variant called “Mata Aces” with Christian de Leon, a wacky game that sorta kinda combines elements of hold’em, stud, and even draw. It’s getting big in Mexico, and perhaps might begin to spread elsewhere as it provides a lot of action -- read about it here. Also enjoyed chatting with Ari “BodogAri” Engel near the end of the night, a very friendly guy who’s played (and won) on just about every tour there is in addition to his considerable online success. Here’s a post sharing what we discussed. 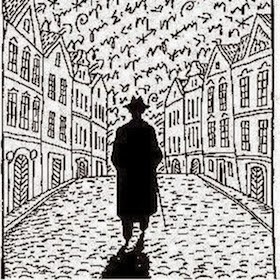 If you’re looking for something else interesting to read today, check out Jonathan Grotenstein’s recent article for All In about Daniel Colman, titled “Silent Assassin.” Grotenstein speculates in interesting ways about the wunderkind’s motives, giving a shoutout to Hard-Boiled Poker along the way by referencing a post of mine where I was attempting something similar with Colman. Gonna cut it short as Day 1b is drawing close. Check the PokerStars blog for reports throughout the day. Have made it safely to Lima, Peru, the 3,200-mile trip (or whatever it is) going about as smoothly as I could have hoped. All flights were on time, my shuttle to the hotel was waiting for me, and the accommodations very comfortable for my six-night stay here in Miraflores. Reading material for the long flight from Miami to Lima mostly consisted of my working through a four-decade old paperback of David Halberstam’s excellent The Best and the Brightest, a book written during the early 1970s that attempts to explain how the U.S. found itself gradually getting involved in the Vietnam morass despite myriad indicators that such a course was not recommended. The 800-plus page book is so old the binding is completely shot, forcing me to hold the sucker with both hands when reading and to use a rubberband to hold it together when I’m not. An emblem for Vietnam, that. Besides being well written and researched, Halberstam is unafraid as well to include his own sharply-drawn judgments along the way, which both helps clarify the mistakes he’s describing while adding an extra layer of intrigue to the narrative. Despite writing so soon after (and during) the events he’s describing, he lends the story useful perspective, allowing those of us reading much later to appreciate the novel-like twists and turns that inexorably led to successive administrations’ poor decisions regarding southeast Asia. Most of my casual reading of late has been about political history, with Nixon and Kennedy having become touchstones for me. I suppose all presidents’ stories provide seemingly endless threads of interest thanks to their connectedness with practically all aspects of American culture, but there’s something about these two in particular -- perhaps the most fascinating heads-up political opponents of the century -- that intrigues me to no end. Will be especially busy this week and so anticipate only firing off short bursts here to share brief anecdotes, likely pointing you to the PokerStars blog as I do where I’ll be filing my LAPT Peru Grand Final reports. There won’t be any politics over there, I can assure, but a lot of interesting conflicts, negotiations, and resolutions over the cards and chips. More to come. A quick one this morning to report I’m back in an airport again, about to make another trip down to Lima for the LAPT Peru Main Event that gets underway tomorrow. This makes my fourth time going down to Lima, I believe, where I’ve seen and reported on some interesting tournaments over the last few years. Always a fun place to go, with the cuisine a great highlight. Yesterday I was looking back through some of my Peru posts here and found myself dwelling in particular on one particular visit, the one in April 2011 when Dr. Pauly and I were there during Black Friday. Crazy time, that. Seemed like everything was suddenly coming to an end then, poker-wise, in so many ways. Probably wouldn’t have predicted then that three-and-a-half years later I’d be going back to Peru yet again. I’m glad I am, though, and expect to see a decent-sized field there along with my many LAPT buds. More to come. After six weeks of the NFL football season, I’m feeling as though I’ve been thoroughly picked apart as far as trying to pick winners in the Pigskin Pick’em contest goes. A month ago I was cheerily writing here about getting an average of two out of three games correct and how that wasn’t too bad, but by now I’ve fallen off that pace considerably and am already in a desperate spot in the pool near the bottom and a dozen games out of the lead just over a third of the way into the campaign. While yesterday didn’t go well at all for me, last week was even more difficult to get through after losing three early games in which the teams I’d picked all blew big leads. Even worse, all three were meaningful games as far as the pool was concerned, for which the picks were evenly divided and thus getting them right or wrong affected one’s standing more significantly. That’s right -- I had Chicago, Tennessee, and Detroit, all of whom had a WP of 80% or better in the fourth quarter of their games only to lose. The Titans were up 28-3 at home versus Cleveland before blowing their game 29-28. I also had Houston beating Dallas in the early game a week ago, and the Cowboys won in overtime, completing a four-game sweep of close ones going the wrong way. This week’s games featured fewer heartbreaks but a lot of surprises (at least for me), thus hurtling me even further down the leaderboard in the pool. Like can happen in poker after enduring a long stretch of losing, I’ve now entered a zone in which I’m doubting my ability to play this game at all. Sure, I might have won at it in the past, but was it all just dumb luck? I take a little bit of comfort knowing that I’m not gambling serious cabbage on NFL football -- indeed, I don’t bet on games at all. For those who are, I have great sympathy, especially after yesterday saw not one but two games end with “pick-6” interception returns for TDs that helped teams (Denver and Arizona) cover spreads during the final seconds. Speaking of, check out Nolan Dalla’s post today titled “Anatomy of an NFL Apocalypse” in which he spells out in profanity-laced detail the “impalement of the heart, mind, and wallet” that was NFL football yesterday. Hello, weekend (almost). Looking back on the week in poker, there were three items I wish I’d had more time to explore with blog posts, but did not. Gonna just catalogue them here to invite comment, and perhaps next week if inspired I’ll get back into issues raised by one or two of them. One was Phil Ivey losing his case against Crockfords Casino in Britain’s High Court. The case started on Monday, then two days later Judge John Mitting decided Ivey was not entitled to the £7.7 million he’d won playing Punto Banco and that Crockfords had withheld from paying out. In Mitting’s view, the “edge sorting” technique Ivey employed “gave himself an advantage which the game precludes.” “This is in my view cheating,” he concluded, ruling in favor of Crockfords. Last week I was mentioning Ivey’s appearance on the 60 Minutes Sports program (which was on Showtime this week, which I don’t get) where he defended himself against accusations of being a cheater. I also mentioned there how out in the non-poker world the stories of Ivey’s suit against Crockfords and more particularly the Borgata’s still-pending one against Ivey have suggested that “cheater” label for him in the minds of some. The Two Plus Two thread about the case indicates most in the poker world were surprised by the ruling and disagreed with it, and that’s the general tenor of response over Twitter, too. Jeff Ma, a member of the MIT blackjack team back in the mid-1990s, has written an op-ed for ESPN’s poker page defending Ivey’s play as not unethical (while expressly forgoing talking about its legality as interpreted by the High Court). A second item popping up here at week’s end concerns those new Spin & Go games on PokerStars which I was trying out over on the play money side when they were first introduced. The new format has proven especially popular, so much so that some sit-n-go regs are not happy about the way they have affected traffic in other games. In fact, a petition “to demand a removal of these games” has been started by one disgruntled grinder -- an extreme-seeming response, to be sure. The petition isn’t really that interesting to me, but some of the discussion that it has provoked both about the Spin & Go format and online poker in general has provided some worthwhile observations. One of the most thought-provoking came from Daniel Negreanu in a contribution to a 2+2 thread about the petition in which he points out that the full-timers (including the Supernovas and Supernova Elites) who are complaining about the way the format attracts recreational players and thus draws the “fish” away from their games are in fact themselves the greatest danger to the online poker’s survival. “Do you know what kills games and destroys the poker ecosystem above and beyond all the things mentioned? Winning players,” explains Negreanu, who goes on to say how if the Spin & Go format does in fact deter pros from playing, that would be a positive as far as the survival of the “ecosystem” is concerned. Negreanu also says that if he were in charge of VIP systems he’d reward the losing players, not the winning ones. It’s an interesting read -- check it out. Incidentally, with regard to “ecosystems” Darrel Plant authored an interesting article this week for PokerNews called “Circle of Life, Circle of Death: Depletion and Replenishment in Multi-Table Tournaments” that provides a nifty, math-based explanation of why poker needs new players (or at least new money). There’s also a very cool simulator embedded in the article which allows readers to input their own numbers to crunch to see how depletion and replenishment works in MTTs. Finally, Martin Short was on Conan O’Brien’s late night talk show this week talking about a poker game he once played with Johnny Carson. Also part of the game were Carl Reiner, Neil Simon, Chevy Chase, and Steve Martin, along with some big-time agents and others. Short had actually never met Carson beforehand, and so was understandably intimidated when participating in the game. As it turns out, there isn’t too much poker talk in the story, but it’s still contains a couple of grins -- you can watch the clip here. It does make me curious, though, to dig a little deeper into Carson’s poker-playing. Indeed, his having had Amarillo Slim Preston as a guest a dozen times in the early 1970s suggests Carson had more than just a passing interest in poker. Like I say, I might get back one or two of these items next week, and if you have thoughts to share about any of them, fire away. Meanwhile, enjoy the weekend, everyone! I wanted to follow-up on yesterday’s post about my bank of nearly 11 years -- Fifth Third Bank -- without warning and with no explanation deciding to close my account. I don’t anticipate writing again about this topic, but after writing yesterday I was able to learn something useful regarding what happened and thought I’d share it. 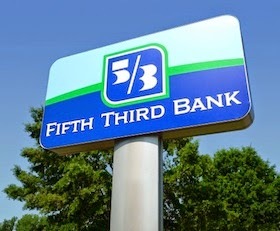 With some difficulty I was today able to speak once more with my (former) local branch of Fifth Third. As I expected, they had no further information for me, and were surprised Customer Service (to whom they had directed me) had sent me back to them. I’d been sent around in a circle, no more informed at the end than when I’d begun. Meanwhile, I very much appreciated the comments to yesterday’s post as well as those I received via Twitter. Among those responding to the post was Grange95, a lawyer, who very helpfully pointed me to a document describing a recently begun initiative by the U.S. Department of Justice called “Operation Choke Point” that appears a very likely explanation for why my account was closed. The report begins by explaining how the initiative was created by the DOJ late last year to “choke out” businesses considered by the Administration to be “‘high risk’ or otherwise objectionable,” with the nominal purpose being “to combat mass-market consumer fraud.” Following the initiative, bank regulators have identified a number of different businesses, industries, merchant types, and activities as “high risk,” strongly suggesting to them that if they continue to serve those involved in the activities on the list they could be subject to federal investigation. In other words, you might say there are two varieties of “pressure” (or “choking”) happening here. One is the Administration pressuring banks to review customers’ account activity, to track and flag those involved with anything having to do with activities on the “high-risk” list, and to close those accounts or be subject to federal investigation. The other is the “choking out” of the businesses by removing their means to conduct financial transactions. The report includes quotes from letters sent by banks to customers informing them that their accounts were being closed. The quotes resemble language appearing in the letter I received (discussed yesterday), and in fact there is one from Fifth Third Bank which specifically tells the customer -- someone whose business is making payday loans -- that their business is the cause of the account’s closure. By comparison, my letter lacked such specificity, only referring vaguely to “federally mandated requirements” as guiding Fifth Third Bank in its reviews of account activity. But from reading the quotes I do think it is probably safe to assume my bank was similarly encouraged simply to close my account rather than have to deal with the threat (real or imagined) of any type of federal investigation as suggested by my apparent connection with one of the “high-risk” activities. Speaking of, also included in the report is a list of 30 different examples of such “high-risk activity.” For a time the list was posted on the Federal Deposit Insurance Corporation’s website as a warning, although I see from a Wall Street Journal article dated July 28th that the list was removed. Among the items included is “On-line gambling” (sic), which appears the only one with any possible relevance to my situation. I’ll mention again that the only account activity I might have had that could be construed as meaningful here would be to have received payments via wire transfer from businesses located outside the U.S. whose interests include poker (live and online) and gambling. In other words, my “business” is not even “online gambling,” but rather writing, editing, and reporting as a freelancer. Some company to be in, eh? However you feel about some of the “activities” on this list -- and some are most certainly objectionable -- it’s easy to see how for nearly all of them merely having such a business or being involved in some fashion doesn’t automatically make one guilty of mass-market fraud, money laundering, or any other unlawful behavior. Issa’s report notes how despite the DOJ’s public statements, Operation Choke Point “was primarily focused on the payday lending industry” before being expanded to include these other activities. “Internal memoranda and communications demonstrate that Operation Choke Point was focused on short-term lending, and online lending in particular,” explains Issa. However, the DOJ seized an opportunity with the initiative to curtail many other types of activities without having even to identify or prove any type of unlawful behavior beforehand. It also makes me think about the many examples of corruption in government I’ve been reading about constantly over the last many months as part of my “Nixon studies.” I was telling Vera how when I read about Watergate and all of the illegal machinations and maneuvers conducted by the Nixon Administration to continue the cover-up, part of me always regards it all as somehow entirely separate from my own experience -- as though it were fiction, almost, thanks to the seeming distance between past and present. But the fact is, there are obviously many contemporary (and similarly astonishing) examples of our government acting in ways we should question and about which we should be concerned, with Operation Choke Point -- as grievous as it appears to be -- hardly the most troubling. A few weeks ago a note appeared in my mailbox saying someone was sending me a certified letter. I could either sign the note and have it delivered or just carry it in to the local P.O. and pick up the letter myself. I decided just to go pick it up, only noticing when I did that the letter had been sent by my bank, Fifth Third. I first opened an account at Fifth Third Bank a little under 11 years ago, I believe, using my checking account there for any transactions related to my career as a freelance writer. (Vera and I have our primary accounts at a different institution.) I had payments sent there and also would use the account for all business expenses (including when traveling). Over the years I have also made various regular payments from the account, including for estimated tax payments, life insurance, and retirement. Fifth Third charges a $15 fee for international wire transfers -- and I often am paid that way -- but most banks do. Once or twice I’ve had a debit card blocked when traveling abroad after not having informed the bank ahead of time I’d be out of the country. I remember once way back at the beginning the bank having to hold payment on a deposited check for a week or so just to make sure it cleared. But otherwise I can’t really think of anything too out of the ordinary. Eventually Fifth Third encouraged me to open both a savings account (which unlike the checking account would draw a little interest) as well as to get a credit card with them. I didn’t really need the credit card, but it was nice to have it as a backup when traveling, and I did use it a couple of times on trips abroad. The letter was dated September 12 and was saying my account would be closed by September 26 -- in two weeks. Not once had I been given any indication anything like this was even a possibility, let alone that my account activity could in any way be considered risky. I went in to talk to them in person. I learned that the person who had signed the letter, the Lead Customer Service Representative at the branch, hadn’t actually written it -- it was a form letter from Fifth Third (from “Compliance,” I think). Also, the Financial Center Manager at the branch was on vacation, with everyone there suggesting I needed to talk to her. So I took out some funds to go open a new account at another bank. Then I returned a week later, a couple of days before the date my account would be closed, to withdraw the rest and hopefully speak with the Financial Center Manager. Again, the conversation was unfruitful. My questions elicited a number of ambiguous responses that vaguely hinted at possibilities though offered nothing definite. They either didn’t have any information regarding why my account was being closed, or if they did they weren’t able to share such information with me. Earlier questions of others in the branch suggested that perhaps my international wire transfers were what had made me risky to them. If so, that was a new development, as I had been receiving the same transfers from the same employers for 6-7 years. One person said something about not being able to see where the transfers were coming from as perhaps being problematic. I pointed out the irony of their not being able to tell me where they were coming from by closing my account, but only earned a grim nod for that effort. I’d also asked about my travel to other countries where I’d use my Fifth Third debit card and credit card -- was that somehow the problem? No one knew for sure. I didn’t ask about every single transaction I’d ever made, although my mind raced back to question all of them, including receiving my refund from the U.S. Department of Justice back in June. Ultimately the official line from my local branch was they were all sorry but they simply had no information for me. I could, however, call the Fifth Third Bank Customer Service line and they might be able to tell me more. Though dubious, I did as instructed and called Customer Service. After all, I needed to know what exactly I had done that could have been construed as risky account activity. My job requires me to travel abroad, as well as to receive payments from various entities. If I could be told why my account was closed, I wouldn’t necessarily be happy -- especially after the sudden kiss-off following more than a decade as a customer -- but at least I’d be saved from the paranoia of questioning every single debit or credit I’d ever made. Not to mention perhaps shake this irrational feeling of being somehow considered by someone, somewhere to be a criminal. What did I learn from Customer Service? You might have already guessed. I needed to talk to my local branch. They knew nothing, and had no means of finding out anything regarding why my account was being closed. The woman I spoke with suggested the local branch should have something to tell me, or at least had the means to find out something for me. I’ll be going back to the local branch. Life goes on. I’ve opened up a new account at a new bank, telling them the entire story beforehand of why I’d been forced to leave Fifth Third and sharing with them more information than I needed to regarding the nature of my work as a freelancer, the fact that I travel somewhat frequently, the fact that I write about poker and thus am employed by businesses located abroad involved with online poker and gambling, among other information. They seem very happy to have me, and assure me there will be no problems receiving my wire transfers, making my payments, and using my debit card while in another country. I had actually hesitated even to share this story, feeling a kind of weird embarrassment about it all. That feeling keeps getting reinforced with every interaction I continue to have with Fifth Third, as though I have somehow done something terribly, terribly wrong -- so wrong they can’t even bring themselves to say out loud what it could be. It’s absurd, I know, but that’s how I’m feeling. But I thought I’d share all this both for my freelancing colleagues and I suppose for anyone else who might have “account activity” at their bank that is at all similar to mine. I know banks have to follow federally mandated requirements, and I also completely understand and accept how they reserve the right to accept whomever they wish as customers. Some banks are more conservative than others in how they estimate “acceptance of risk.” And some are more accommodating than others, too, when it comes to their treatment of long-standing customers. Check into it all as much as you can, I suppose, and hopefully your communications will be more successful than mine have been lately. Obviously much worse things can happen to a person than to have his bank suddenly reject him this way. It’s damn unsettling, though, and like I say it’s hard not to feel a little like Joseph K in The Trial getting sent back and forth without any answers to my questions about what exactly my “crime” was. Getting the account closed was bad, but not getting any explanations for it is much, much worse. I’m up late tonight following the Super Tuesday on PokerStars while also looking in occasionally on the WSOP Asia-Pacific coverage down in Melbourne. Was mentioning yesterday the smallish fields the events are attracting during this, the second WSOP APAC, and with the Super Tuesday sitting right in front of me as well, it’s hard not to be making comparisons. This week’s Super Tuesday drew 590 entrants, thereby creating a prize pool of $590,000. A $1,050 no-limit hold’em tournament that’s been around about five years now, the Super Tuesday has been steadily increasing in size ever since Black Friday when U.S. players were subtracted from the mix. During the weeks following April 15, 2011, the tourney was drawing fields of about 200 players, though entries began picking up as months went by and by the end of that year it was hitting the 400-plus mark again as it had previously. The tourney was given a $300K guarantee and during 2012 began averaging close to 450 players, even drawing more than 500 on several occasions. Then last year the Super Tuesday drew more than 600 nearly a dozen times, something that’s been replicated again in 2014. And it even cracked the 700-player milestone once this year, setting an all-time high for the tournament when 711 players participated back on April 1 of this year (no shinola). Currently the Super Tuesday has a $400K guarantee (the increase happening during the late summer). It has averaged just over 568 players every single week, save during SCOOP and WCOOP when it goes on hiatus, so this week’s turnout of 590 is fairly typical. It’s looking like Event No. 6, the A$1,650 8-Game Dealer’s Choice event, like Event No. 5 is probably going to draw fewer than 100 players, meaning the prize pool is going to be south of A$150,000 and first prize will probably be at most around A$45,000 -- less than what the fourth-place finisher in tonight’s Super Tuesday will earn. One Australian dollar is currently worth around 88 cents U.S., which means the biggest prize pool thus far at the 2014 WSOP APAC (Event No. 1’s A$611,000) was worth a little under $535,000 USD -- in other words, less than this week’s Super Tuesday prize pool. While the Super Tuesday has the biggest buy-in of any regular online tourney these days, it isn’t the biggest weekly online tournament. The $215 buy-in Sunday Million usually has a prize pool that is bigger than twice the Super Tuesday’s, and the Sunday Warm-Up (also $215 to play) generally has prize pools that are a little larger, too. I know we’re talking apples and oranges here, making it a little unfair to compare big online tourneys (especially those on PokerStars) to live events like the ones happening in Melbourne this month. It is interesting, though, in this context to think again about the whole bracelet debate and how these WSOP APAC events have but a fraction of the field and smaller prize pools and buy-ins than events staged on a weekly basis online. Was mentioning on Friday all the tournaments happening this month all over the world. Just realized today the World Poker Tour has an Alpha8 event kicking off in London, too. Today I’ve been watching the UKIPT Isle of Man Main Event final table on PokerStars.tv, enjoying as always the delayed live stream they provide. I haven’t yet managed to look in on any of the WSOP Asia-Pacific live streaming, nor have I really been able to do much more than read the recaps of the action from Melbourne thus far given the 15-hour time difference. Because of that, I’ve found myself mainly interested in the turnouts for the WSOP ASAP events thus far and that WSOP Player of the Year race between Brandon Shack-Harris and George Danzer who are essentially even and also far enough ahead of the pack so as to be only ones still in the running. The first four of 10 scheduled events have gotten going thus far in Melbourne, with a couple having completed. Event No. 1, the A$ 1,100 No-Limit Hold’em Accumulator, drew 611 total entries, down more than 43% who played the same event there in the spring of 2013. Event No. 2 (A$ 2,200 NLHE) drew 215 entries; that one wasn’t offered the first time around. Meanwhile Event No. 3, the A$ 1,650 Pot-Limit Omaha, saw 123 enter, again down a little over 28% when compared to the 172 who played that one last year. Event No. 4 is also a new event, the A$ 1,650 NLHE “Terminator” (involving bounties), which drew 250. So small fields again for the WSOP ASAP -- even smaller than the first time around -- which’ll lead to more talk about the bracelets’ relative value. Will be interesting to see how many play the bigger buy-in events, including the A$ 10,000 Main Event and the A$ 25,000 High Roller. The smallest turnout for any WSOP APAC in 2013 was 81 players for the A$ 2,200 won by Phil Ivey. All of the rest of the prelims on this year’s 10-tourney schedule are unique when compared to the five played in 2013, so only the Main Event will offer a direct comparison when it comes. Daniel Negreanu won it last year when they drew 405. If that were the line this time, I think most would be betting the under. Meanwhile on the WSOP POY front, both Shack-Harris and Danzer cashed in Event No. 1, with Danzer’s 22nd-place finish earning him a few more points than the min-cash Shack-Harris got for finishing 53rd. That put Danzer at 762.20, nudging him just ahead of Shack-Harris who has 760.50. Neither cashed in Event Nos. 2 or 3, but Shack-Harris is in the money in Event No. 4 where the top 27 made the cash (all of whom return tonight/tomorrow). In fact, Shack-Harris knocked out Danzer in that event, collecting a $500 bounty while also ensuring his POY foe wouldn’t be gathering any points from his finish. If I follow the formula correctly, I think Shack-Harris has assured himself at least 7 points out of Event No. 4, what he would get for finishing anywhere from 19th to 27th. If he wins the sucker, though, he grabs a bigger bounty of 140 points (I think) to assume a commanding lead. Looks like the WSOP APAC live stream starts at 12:10 p.m. each day Melbourne time, which I believe is just after 9 p.m. my time (ET). One of the these nights I might try to tune in, probably when that Main Event rolls around. Then again, as I was talking about Friday, the EPT London Main happens then, too, and might use up all my poker-watching attention before the night comes around. So much poker happening around the world this month as pretty much all of the tours crank back up again, including the World Series of Poker Asia-Pacific which has already gotten going down in Melbourne. There’s the UKIPT stop in the Isle of Man (already begun), to be followed immediately by the UKIPT London and then the EPT London series. That then overlaps with WSOP APAC which goes through Oct. 18th. 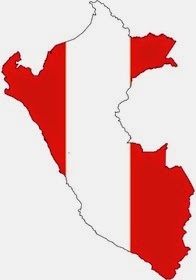 Even before that ends, the LAPT has another stop in Lima, Peru, where I’ll actually be heading again. And of course there’s a lot happening Stateside, too. Regarding the WSOP APAC, that WSOP Player of the Year race in which Brandon Shack-Harris and George Danzer are nearly tied adds a little bit of interest when it comes to the 10 bracelet events that are being staged there. Both are playing the series, taking their duel up through the very last event. I’m with those who think the WSOP POY shouldn’t really bother with the Europe and APAC legs, given how so many who might genuinely be competing for it aren’t traveling to those places to play. In any case, it will be interesting to see where players go once the EPT London Main Event rolls around. The first of two Day 1 flights for that one happens Sunday, October 12, with the final table Sunday, October 18. Meanwhile the WSOP APAC Main Event also begins on Oct. 12 (also with two Day 1s) and runs through Oct. 18, with the two exactly coinciding. The EPT London Main Event has a £4,250 buy-in (the equivalent of almost $6,800 USD) while the WSOP APAC Main costs A$10,000 to play (a little under $8,700 USD at present). Last year EPT London drew 604 entrants (with a £5,250 buy-in), while the WSOP APAC Main in the spring of 2013 had 405 players enter (with the same buy-in). Also relevant to a lot of players is the fact that not only is the UKIPT London stop coming just before EPT London, there are 45 different events happening between the two series; meanwhile, the WSOP APAC has just the 10 bracelet events. Both the WSOP APAC schedule and the EPT Season 11 schedule (including the London stop) were announced at practically the same time in late April this year -- it might have been the same day, if I am remembering correctly -- and while there was a lot of lamenting at the time by some at the conflict, it sounds like it wasn’t necessarily intended by anyone or could be helped, either. I know a lot of what affects the scheduling of these is outside the control of the tournament series organizers, and would guess neither the EPT nor the WSOP desired this happenstance. That said, the situation creates an interesting heads-up match between the two that week. Like I say, though, I’ll be in South America, following all that from Peru. Actually that quote comes from a reporter who has filtered Jeter’s perspective into the above paraphrase. You can read the original in a letter by Jeter on the site in which he talks about his own career and experience with the media, and how that experience appears to have helped inspire the idea for The Players’ Tribune. On the one hand, it’s an interesting idea. I’ll admit I’m not that intrigued to read about Jeter’s emotions or those of Russell Wilson, the site’s first contributor who has shared a confessional-type story about being a bully as a youngster. (Like Jeter, Wilson has also routinely been “robot”-like in every interview situation I’ve ever read or seen.) But there could be some contributors to come whose stories I might want to hear. Then again, social media and other forms of online communication have already well established numerous avenues for players to deliver their stories and opinions in an “unfiltered” way -- to the detriment of some of them. It reminds me a little of about five years ago once Twitter had become popular, then suddenly I realized when reporting on a tournament I was amid the “Land of 1000 Reporters.” Today all poker players can, if they wish, tell their own stories with as much detail as they wish. And many of them do -- everyday, and without cessation. In some cases, reporters tell those stories again, often “filtering” them to suit some purpose. So, too, has already happened with both Jeter’s letter and Wilson’s column, with articles on practically every sports and sports-related site retelling those stories with different emphases and conclusions. Of course, any currently-employed professional athlete will hardly be speaking without constraints on The Players’ Tribute -- their agents and teams’ managements will ensure that. Might be curious, though to see if the site (or others like it) might affect the way people perceive the athletes who contribute and/or the sports they play. I continue to be an intermittent play money player on PokerStars. That’s where I started with online poker over a decade ago -- playing the play money games on PokerStars -- and these days that’s pretty much all the online poker I’m playing as I don’t live in Nevada, New Jersey, or Delaware and I’m not currently interested in the giving up the time or money or accepting the inherent risk that’s involved with playing on any of the “rogue” sites. I still very much like the PokerStars client, and I’m always glad when any of the innovations they introduce for real money players like new games or formats are trickled down to the play money side, too, just so I can try them out. One new game just introduced on PokerStars is this “Spin & Go” variation on the traditional sit-n-go. You choose a buy-in and soon afterwards are sat down at a three-handed, winner-take-all, turbo-structured SNG. The prize, however, isn’t calculated by adding up the three players’ buy-ins. No, instead before the game begins you watch numbers spin on a slot machine-like display that ultimately land on a number representing the payout. For example, in the 1,000 play-chip Spin & Go, prizes range from 2,000 (in fact less than the 3,000 the players have paid) all of the way up to 1,000,000. I believe for all of the buy-ins the largest possible prize is 1,000 times the buy-in while the smallest is 2 times the buy-in. Of course, the likelihood of getting to play for 1,000 times the buy-in is quite small. 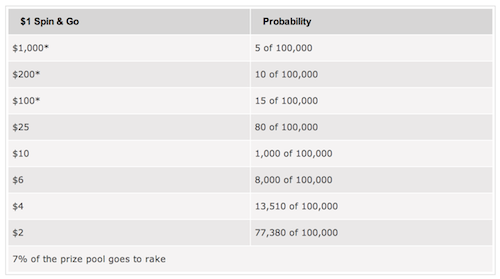 Below is a chart reflecting the probabilities for a $1 Spin & Go tournament. I did a little math to see how the distribution of prizes ensures PokerStars comes out ahead (natch) -- I think to the tune of about 8 cents for every dollar. Playing a bunch of play money Spin & Gos I noticed right away how for most of them I’d only be playing for 2x my buy-in, as the probabilities would suggest should happen. I also noticed how there was something slightly addicting about registering for another one -- or several at once, as the client makes it easy to do -- and giving the sucker another spin in the hopes of getting lucky and hitting a bigger first prize (and then winning the thing). The format is kind of fun and does satisfy what for me has become the primary way I play on the site -- usually just jumping into quick heads-up matches or short-handed sit-n-gos, often of the turbo variety. It does introduce another layer of luck onto poker, and I’m sure there are reasons to point out why it’s not such a great format for players’ bankrolls (or for encouraging more serious, studied poker). But it’s still fun taking it for a spin, even just for play.